For those of you with an iPhone, you must add the AceBudget App. 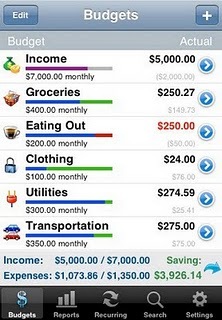 It is an easy way to track monthly finances. The app allows you to put in your disposable income and add categories for the types of spending you have each month – Groceries, Eating out, Clothes, etc. I started using it in the beginning of February, and it definitely has given me an “ah-ha” moment already, considering I have $33.00 left to last me until the end of the month! 🙂 Make 2011 a fiscally responsible year!